The Conservatives have made big gains across Scotland, with just a handful of the country’s 32 councils still to declare their election results. The Tories have increased their number of councillors by more than 100, including in areas that had previously been “no-go” for the party. But the SNP is on course to replace Labour as the biggest party in Glasgow . The SNP has already become the largest party in Aberdeen, and looks likely to do the same in Edinburgh . However, the party has lost overall control of Dundee and Angus councils, the only two areas where it had won majorities in 2012, after the Conservatives increased their number of seats. The Tories have also won seats in areas including Shettleston in Glasgow and the Paisley North West ward, which includes Ferguslie Park – two of the country’s most deprived areas. 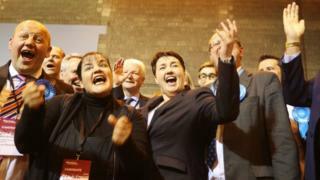 Speaking as she arrived at the Edinburgh count, Scottish Conservative leader Ruth Davidson said people across Scotland were “looking for this Scottish fightback against the SNP”. Labour losses mean it cannot now win another majority in Glasgow, where it has held power for decades, but the SNP also looks unlikely to win outright control despite becoming the biggest party. Labour’s support has slumped across the country, with the party expected to finish third behind the SNP and Conservatives in Edinburgh – where it had been the largest party. Elsewhere, the SNP has also replaced Labour as the largest party in Renfrewshire and West Dunbartonshire, which had both been majority Labour councils. First Minister Nicola Sturgeon, the SNP leader, has arrived at the Glasgow count, where she greeted SNP councillors and described their performance as a “clear, emphatic win for the SNP”. With 28 of Scotland’s 32 councils having declared their full results, the SNP had 327 councillors, an increase of four seats so far. The Tories had won 237 seats, an increase of 136, meaning they comfortably replaced Labour – which was down 84 seats to 173 – as the second largest party across the country. There were also 168 independent, 66 Liberal Democrat – an increase of one – and 12 Scottish Green councillors, four more than the Greens won in 2012. No party has yet managed to win majority control of a council – meaning they will either be run by coalition or minority administrations. The final results in Aberdeen showed the SNP on 19, up three on 2012, while Labour lost nine of its 18 seats and the Conservatives went from three to 11. The Lib Dems dropped from five to four. But in Angus, the SNP dropped from 14 seats to nine, while the Conservatives doubled their number of councillors to eight. There were also nine independents and two Liberal Democrats, while Labour lost its only seat. In neighbouring Dundee the SNP went from 16 seats to 14, while Labour gained one seat, giving them nine councillors, while the Conservatives gained two – taking them to three. There were also two Liberal Democrat councillors elected, doubling their total from the previous election, and one independent. In Stirling, the Conservatives increased from four seats to nine, the same number as the SNP, while Labour dropped from eight seats to four and the Scottish Greens also won a seat. The biggest news from Glasgow is that Labour have lost control of the city council. It wasn’t unexpected, with the party only running 43 candidates – the exact number needed for a majority. They’re not even going to come close to that. The SNP, which dominated recent Holyrood and Westminster elections in the city, has taken Labour’s place at the top – but it’s looking increasingly unlikely they will take overall control of the council. With eight wards still to declare, the SNP needed almost all of their remaining candidates to be returned if they’re to get to that magic number of 43. That would mean winning three seats in several four-member wards, something the party has failed to do anywhere in the city so far. So, depending on how slim the margins end up being, coalition talks could be on the cards in Glasgow. This means the smaller parties could come into play as kingmakers. The Greens have already increased their representation on the council, currently up to six seats, and could be well placed to do a deal should the final numbers stack up. On the same number of seats but with more or less zero chance of doing a deal with anyone are the Conservatives – not that they’ll mind. The Tories have had a very good day, increasing their share of the vote all across the city and boosting their number of seats from just one in 2012. During the election campaign, SNP leader Nicola Sturgeon said a win for her party in Glasgow “would be hugely significant” but insisted she would “take nothing for granted”. The election used the single transferable vote system (STV), with voters ranking candidates in order of preference. The system makes it difficult for any one party to win overall control of a local authority, with many being run by coalitions or minority administrations. People aged 16 or over were eligible to vote, with more than 4.1 million people in Scotland registered. A total of 1,227 councillors will be elected across the country’s 32 local authorities, with more than 2,500 candidates putting themselves forward.